The xvi extra pages are a special section on the history of "Die Terranauten", with a table of contents for this section on p. i; the  extra page features four adhesive buttons. The technical illustration actually takes pp. 42 & 43. On p. 65 is a preview for the next issue. Pp. 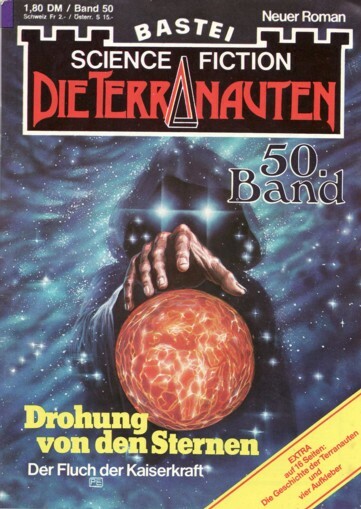 2, 63 and 66-68 are ad pages (also, a small ad on p. 49 lists five Bastei Lübbe books of the same month). The cover art is signed 'PE'.